We work hard to give you same day delivery. We are ethical and compliant. You’ll always know your market rate and transaction cost when you move money. The exchange rate you get from AquireFX is the wholesale buy or sell rate that our FX provider gives us. 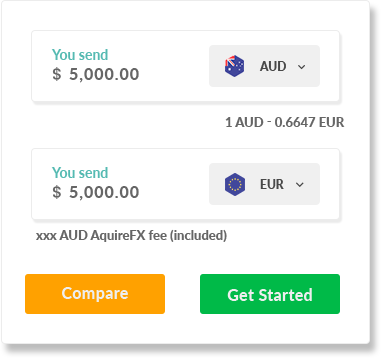 We add a transaction fee based on how much money you are converting. We pay the bank fees we can control. But sometimes international banks charge fees we have no control over, so we don’t pay for those. Our approach means you get the exchange rate used by big businesses. Not one designed to hide extra fees. You can verify the rates we use at any of the independent exchange rate data providers.